This baked salmon fillet recipe is one of the easiest recipes for baked salmon you will find, and it tastes just delicious. The addition of the spinach leaves keeps it moist and adds a wonderful taste. 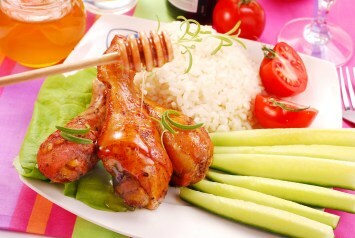 Overall, it is a great mix of favors, and would make a perfect recipe for entertaining. Arrange spinach leaves on the bottom of a 13"x9" baking dish. Lay salmon on top. Sprinkle salmon with dill, salt and pepper. Mix water and butter together and pour it over the salmon. Top with green onions and garlic. Cover the baking dish tightly with foil. Bake for 25 to 30 minutes, or until salmon flakes easily when tested with a fork, basting two or three times. Serve with the spinach and juices. This recipe can also be made using other solid fish fillets, like haddock, cod or halibut. All fresh herbs add nutritional value, including dill. And dill of course seems like it was invented to pair with salmon and other fish! Baked salmon is so easy and quick to make though that you can serve it any day of the week. And the extra benefit? In addition to tasting fantastic, salmon is one of the healthiest foods we can eat. Find out why here. 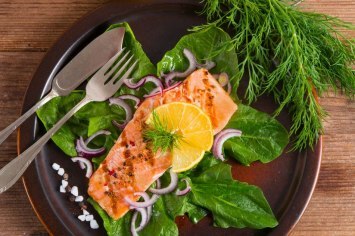 This fabulous healthy salmon recipe is perfect for gluten free diets, low carb diets and diabetes recipes. Look here for more recipes as tasty as this baked salmon fillet recipe. I always make this recipe without the spinach leaves and refrigerate overnight to make the absolute best salmon salad sandwiches! They are always a huge hit at showers, cocktail parties and luncheons. I am always asked to bring them to any special occasion family or friends may have. Just a couple of scoops of good mayonnaise and voila! – gourmet sandwiches!